Vector Displays offers a variety of trade show display rental properties, including pop up trade show booths and custom island trade show exhibits. If we don’t have what you need in stock, we can develop a rental solution that meets your needs. 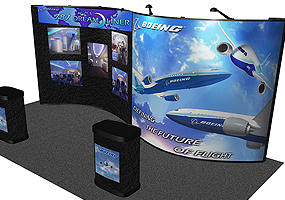 Attractively designed 10-foot concave and 10-foot convex pop-up display; includes a four panel photomural, detachable Velcro applied graphics, two detachable podium graphics, and two fabric end panels. This package includes lighting and cases. If shipping and taxes are necessary, those additional charges are extra. 10-foot show-ready pop-up with spotlights, four photomural panels, and shelving in one convenient shipping case. The trade show display is the "visual speed bump" you need to slow down trade show attendees on the show floor! 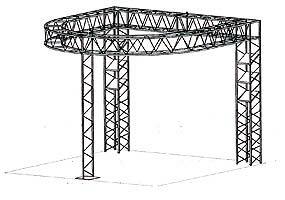 10x10-foot truss display system that gives you configuration options. 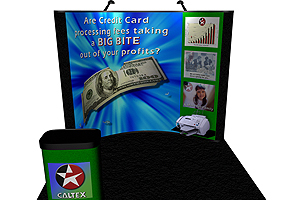 This trade show display has audio visual presentation capabilities and in-house, show-ready graphics. 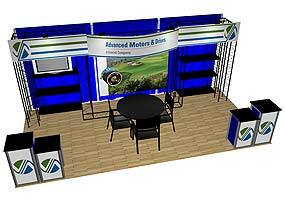 It also allows you to have wrap-around truss graphics or a large background graphic to grab attention on the show floor. If shipping and taxes are necessary, those additional charges are extra. 10x20 trade show display includes: truss exhibit configuration as shown, four 3- foot wide shelves that can hold your product or flat screen monitors, a large 4-color fabric mural with your image, a curved bridge header that invites attendees into the booth, and expansive literature shelving to showcase brochures. This trade show exhibit also has room for optional plasma screens that can be mounted in center, and/or over product shelves on each side wing. If shipping and taxes are necessary, those additional charges are extra. 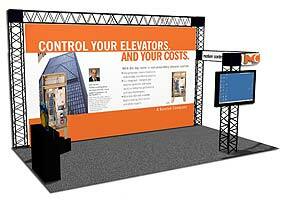 Truss trade show exhibit features a large 18-foot wide trade show graphic mural with impact. 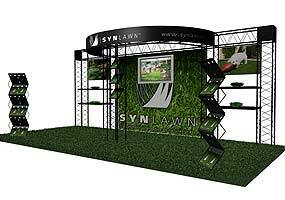 This trade show truss exhibit works for inline displays and island booths. The truss exhibit bridge, demo station, and audio visual kiosk help engage trade show attendees by putting your trade show presentation on display. This display provides room for exhibition demos, lead stations, and exhibit visitors. If shipping and taxes are necessary, those additional charges are extra. 10x20ft modular truss exhibit system with durable triple-shelf product area and three 24" x 24" x 40" movable product demo stations. This trade show exhibit features a center graphics area that allows for signature branding of your company's corporate image. The right side wing enables trade show specific messaging. Natural wood flooring offers an inviting and open area for exhibition attendees to enter and visit (furniture shown not included). If shipping and taxes are necessary, those additional charges are extra. When should I rent and when should I purchase booth components or carpet? A good rule of thumb is that the cost to rent is approximately one third the cost to purchase, excluding the cost of graphics because they are not able to be re-rented. If you are going to use your booth only a few times a year, it is probably better to rent. You will then avoid paying storage costs between shows. Even if storage is not a factor, another consideration is that as accessories and materials advances become available, a booth can look dated fairly quickly. "Vector Displays pays attention to details and makes sure any problems are addressed promptly and efficiently. In the trade show and events business, something always goes wrong. Vector Displays works hard on our behalf to take care of any problem that arises, whether it is in shipping, on the show floor, or in working with other contractors. Many times they could have blamed someone else, but instead, they worked to help our clients solve the problem, even when the problem was not one for which Vector Displays was responsible."